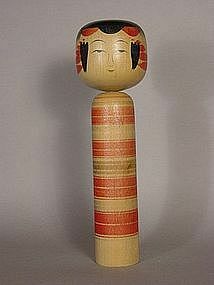 Kokeshi, wooden folk doll of NE Japan. H. 6.25". This is an example of Zao-kei (Zao Onsen [Hot Spring]) of Yamagata Prefecture. 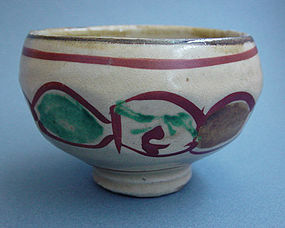 The artisan is Kobayashi Chuujiro, who made this piece in his 60's, ca. 1990. 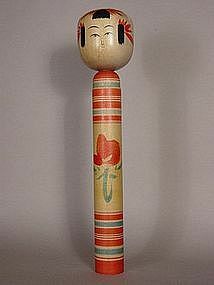 For more information on "dentou" (traditional) kokeshi, please visit our weblog, which is accessible via our Trocadero homepage. 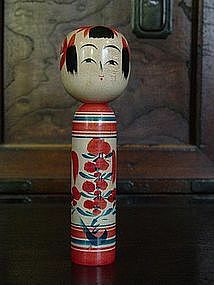 Kokeshi, folk toy of NE Japan. Wood, height 9.625". This is a Yajiro-kei (Yajiro-classification) kokeshi, generally crafted in the vicinity of Shiroishi City in southern Miyagi Prefecture. However, this particular craftsman, Sato Seikou (? ), lives in the next prefecture of Fukushima, on the coast in Iwaki City. He was born on February 22, Showa 22 (1947). 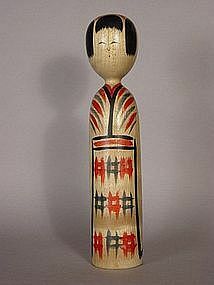 This kokeshi probably dates from ca. 1980. 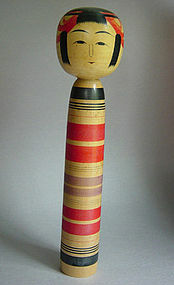 Kokeshi, folk toy of NE Japan. Wood, height 12". Tsuchiyu-kei of Tsuchiyu Onsen (Hot Spring) in Fukushima Prefecture. Made by Saito Hiromichi, born August 8, 1930. 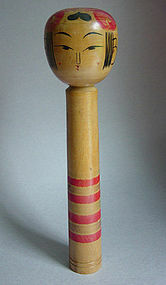 This kokeshi is probably from ca. 1980. 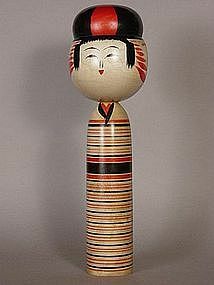 Kokeshi, folk toy of NE Japan. Wood, Height 9.875". Tougatta-kei, Miyagi Prefecture. Although of the Tougatta classification, the maker, Umiya Yoshiemon (Umitani Kichiemon?) lived in Sendai City. He was born in the 38th year of the Meiji Era (1905) and passed away on April 20th, 1985 at the age of 79. 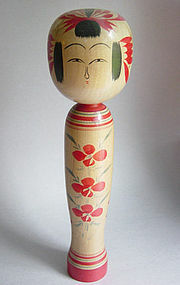 This particular kokeshi probably dates from the 1970's or earlier. 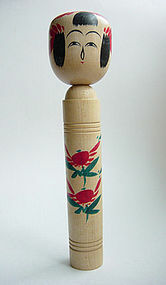 The "bun" haristyle is an interesting feature of this kokeshi, which also appears on some other Tougatta style dolls. 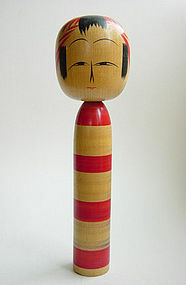 Kokeshi, folk toy of NE Japan. Wood, height 12". Yamagata-kei classification of Yamagata Prefecture. Made by Kobayashi Koutaro of Yamagata City, born March 13, 1936. 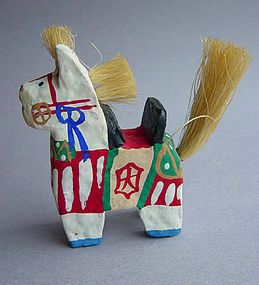 This kokeshi probably dates from the late 1970's. 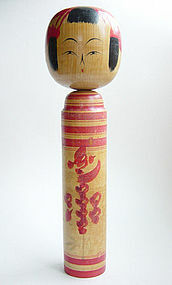 The very thin body of this kokeshi is an unusual and interesting characteristic. 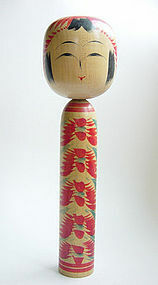 Naruko-kei Kokeshi by Tsugawara Wahei, born Sept. 13, 1945. Wood, Height 7". 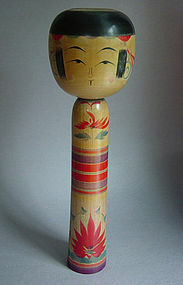 Although this is a typical Naruko stle kokeshi, the words "Kaizen Damashii" (Group Spirit) have been written over the normal decorative patterns. Also written is "Mogami Denki Kabushiki Kaisha" (Mogami Electric Company, Inc.) This was probably commissioned and given out to company employees at a corporate solidarity event or campaign. Probably dates from the 1980's. 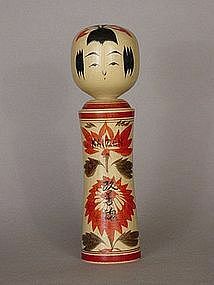 Kokeshi, folk toy of NE Japan. Wood, Height 9.75". Kijiyama-kei of Akita Prefecture. Made by Satou Shuuichi, born Aug. 7, 1927. 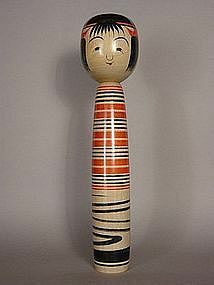 This kokeshi probably daes fromt he 1970's-1980's. 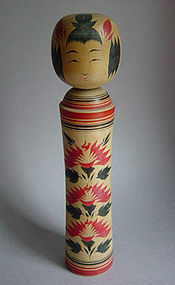 One of the unique & interesting characteristics of Kijiyama style kokeshi is the depiction of the apron ("maekake" or "maedare") on the body of the doll.